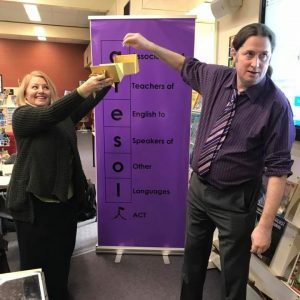 ATESOL ACT were excited to present Joe Dale, colloquially known as the ‘app-smashing man’ for a 3 hour TQI accredited workshop on using multimedia applications to enhance English language learning. Joe hails from the Isle of Wight in the UK and started his professional life as a foreign language teacher. He came to realise how digital applications were helping his students so set off to explore the dynamic digital world for himself. 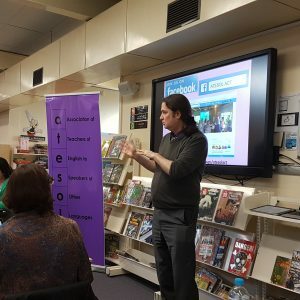 Joe led participants through a range of applications including Adobe Spark video, using QR codes to create a ‘talking wall’, Padlet and Book Creator. The beauty of using multimedia applications with our students is the adaptability of the settings to match particular outcomes that we want to achieve. Participants left the workshop feeling invigorated to implement one, some or many applications in their classrooms. Joe assisted President Bronwyn Singh to draw the members’ competition for registration at the ACTA 2018 Conference in Adelaide in October. Congratulations to Natarsha and Antony! ATESOL ACT member Lesley Cioccarelli shared her passion for using social media platforms as a way of developing one’s own professional learning. The connectivity available through social media such as Twitter and Facebook is ideal for discussion and enquiry on a range of topics, particularly in the TESOL world. Useful links can be found here. Attendees were greatly interested in the Facebook group ‘EAL/D Teachers’ Network – TESOL’ which can be found here. And of course, you can find ATESOL ACT on Facebook and Twitter. 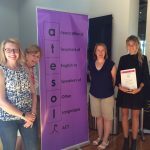 2017 saw ATESOL ACT initiate regular events to provide a social and networking opportunity for professionals working in the TESOL field. These events occurred once a term on a Friday afternoon – in Terms 2 and 4 at EQ Cafe in Deakin and in Term 3 at The Duxton in O’Connor. These events are continuing in 2018, on Friday of Week 6 in each school term. In Term 1 the networking event was combined with the Annual General Meeting at The Duxton. There was a large gathering of interested professionals, some of whom were elected to the 2018 committee. Jennifer Mayers, EAL/D consultant, led participants in a dual-session professional learning experience to unpack the ACARA EAL/D Language Progression and its effectiveness as a tool to differentiate for EAL/D learners. In the first session Jennifer explained the core idea of having four broad phases to describe the progression of learning English as an additional language. The specific descriptions in the phases for each mode of language (listening, speaking, reading/viewing and writing) provide pointers to guide teachers in knowing the next thing that will help a learner make progress towards language proficiency. Having understood the broad premise of the phases, participants were guided to identify classroom factors that contribute to support of learners situated within each phase. To conclude, Jennifer provided participants with examples of sentences to ignite discussion around why there are layers of complexity within English syntax. A case study of differentiation was provided by Fern Hyde, Laurel Rodrigues and Bronwyn Singh. Starting with knowing the particular curriculum content description the identified phase of progression of the students assists with providing appropriate information with correlating lexical density, designing learning experiences to extend students in developing proficiency and outlining the product that students will produce. Participants gained a deeper insight of how the EAL/D Progression is a valuable asset in describing individual students’ learning need. On 13 May, 2017 Dr Jennifer Hammond held a three hour workshop on the role of classroom talk in building curriculum knowledge, and the implications for working with EAL/D students in mainstream classes. The ATESOL session was targeted for practicing EAL/D teachers, and mainstream teachers with an interest in EAL/D issues. While Dr Hammond drew on research findings from studies in primary schools, the material was relevant across teaching sectors. Dr Hammond is an honorary associate professor in the Faculty of Arts and Social Sciences, University of Technology, Sydney. She has taught for many years in the fields of language and literacy education, EAL education and research design. Her research interests are in literacy development; classroom interaction, and the implications of socio-cultural and systemic theories of language and learning in EAL education. She has published widely in these areas. She is currently involved in research addressing the needs of newly arrived EAL and refugee students in Australian schools. The program addressed the role of classroom talk in developing higher mental processes and deep learning. It explored implications for teachers working with EAL/D students in their mainstream classrooms, including the need to balance talking to learn and learning to talk. Examples highlighted the need to provide all students, but especially EAL/D students, with access to high levels of support to ensure they are able to participate in high challenge curriculum programs. Dr Hammond noted that not all group work and talk is constructive; for talk to be useful, both teachers and students need to explore the central purposes of the lesson in depth. Achieving this requires scaffolding to be planned into lessons, and to be provided at points of need as lessons unfold. The presentation drew on data from curriculum programs where teachers deliberately designed-in opportunities for their EAL/D students to engage in sustained talk in learning, while they also drew on notions of scaffolding and message abundancy to provide support for their students’ language and literacy development. Dr Hammond argued that the kind of balance achieved in these programs is a necessary pre-requisite for EAL/D students in their development of higher mental processes and deep learning. She also argued that a balance of talking to learn and learning to talk provides a solid basis for students’ academic literacy development. Student engagement in extended and in-depth “literate talk” supports learning academic English, which in turn supports the development of reading and writing. Group work by workshop participants identified the importance of teachers identifying oral language requirements and explicitly developing oral skills. In referring to work by Pauline Gibbons, Dr Hammond suggested that teachers should interact with all students, including EAL/D students, as if they are worthy conversational partners. Alexander, R (2008a) Toward Dialogic Teaching: Rethinking classroom talk (4th ed) York, Dialogos, Thirsk, UK Ltd.
Alexander, R. (2008b) Essays on Pedagogy. London, Routledge. Hammond, J. (2016) Dialogic space: intersections between dialogic teaching and systemic functional linguistics. Research Papers in Education. 31(1), 5-22. Hammond J. & Miller J. (eds) (2015) Classrooms of possibility: Supporting at-risk EAL students. Newtown, Primary English Teaching Association Australia. Hammond, J. (2015) Teaching and Learning Practices with at-risk EAL students. In Hammond J. & Miller J. (eds) Classrooms of possibility: Supporting at-risk EAL students. 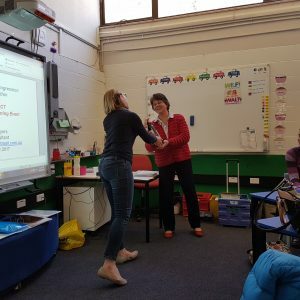 Newtown, Primary English Teaching Association Australia. Hammond, J. (2014a) The Transition of Refugee Students from Intensive English Centres to Mainstream High Schools: Current Practices and future possibilities. Sydney, NSW Department of Education and Communities. Hammond, J. (2014b). An Australian perspective on Standards-Based Education, Teacher Knowledge and English as an Additional Language students. TESOL Quarterly, 48(3), 507-532. Vyotsky, L. (1978) Mind in Society: The development of higher psychological processes. 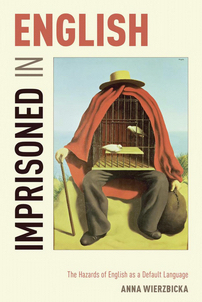 Edited by M. Cole, V. John-Steiner, S. Scribner & E. Souberman. Cambridge MA: Harvard University Press. ATESOL ACT held the 2017 Annual General Meeting held at Canberra Museum and Gallery (CMAG) on Friday 3rd March. Fern Hyde was elected unopposed to continue as President following on from 2016. Tash White from the University of Canberra received the Outstanding Award for TESOL Education. 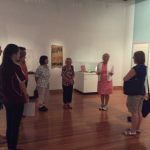 Attendees were then treated to a walk-through of the exhibition ‘Memory of the World in Canberra’. The exhibition was inspired by the UNESCO Memory of the World programme and brings together items of documentary heritage held in Canberra’s cultural institutions. The display of items is organized around themes that range from Australia on film to planning the ‘ideal city’. The collected group was awe-struck by some of the items, including an Academy Award ‘Oscar’ for Best Documentary 1942 for the Film, ‘Kokoda Front Line’! CMAG is a treasured location to visit that highlights so many special things about our capital city and its connection to the world. Associate Professor Misty Adoniou presented her ground-breaking approach to teaching spelling. 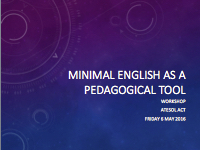 The session explored phonology, etymology, morphology, and spelling pedagogies. With over 18 years of experience, Mallika has participated in PIEP (Primary Intensive English Program) for Refugees, Using Mobile devices for EAL/D learners, Multicultural Story-box Project, Leadership Project as well as Developing Student’s Linguistic Repertoires for Language development project. On Saturday 30th July 2016, a highly motivated group of teachers gathered at Duffy Primary School to take part in a most informative presentation by Mallika Das, an EAL/D teacher mentor at Auburn Public School in Western Sydney – a school with a population of 99% EAL/D students. Mallika started by providing a rationale for bilingual reading programs at her school. We heard all about her research based evidence that reading in the home language can positively affect reading ability in the target language. She also touched on the positive effects for parents as they gain knowledge of how Australian school systems function. After reviewing some relevant legislation and policy documents, Mallika went on to detail some of the successful programs in place at her school. We watched video clips of Bilingual Stories in Class and heard about Community Language Programs. Mallika explained how classes were structured according to home language in the first year of schooling and consequently how students shared their learning with their parents. Parents are valued as active participants and Mallika runs various parent information sessions, providing training in how to read with children, ensuring their access to bilingual texts and enlisting their help in creating resources. They are even assisted in gaining their WWVP cards! Mallika outlined the school’s Bilingual Story Time program and shared some related activities to enhance comprehension and writing skills. We saw how Language Maps were used effectively in the classroom and got the chance to draw our own! As always, we ran out of time and had to farewell Mallika as she made her way back to Sydney. A huge thank you Mallika for taking the time to share best practice with us here in chilly Canberra! 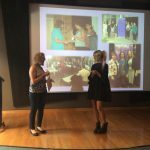 Also on the program for the morning were the presentations by ATESOL ACT’s 2016 ACTA Conference registration scholarship winners Jennifer Mayers (School sector winner) and Lesley Cioccarelli (Adult sector winner). Read their Conference reports on our Blog page. On Friday 6th May, interested professionals from all sectors gathered at the ANU for a workshop facilitated by Lauren Sadow, a PHD candidate with an extensive background in the fields of Linguistics and TESOL. Lauren launched us straight into our first activity. How would we explain the concept of “proof” in our classrooms? This generated much lively discussion. Would we use scientific, mathematical or textual examples? Would we physically demonstrate? One thing we all agreed upon was the difficulty in explaining concepts which are not directly translatable into other languages or which don’t exist in many languages. “Proof” is a classic example! Lauren then led us through another exercise where we applied the Minimal English tool to explain other concepts – amazing, interesting, fantastic, wonderful, great and terrific. There was much debate about the nuances of meaning in that list! Lauren impressed upon us that when applying Minimal English to feelings we needed to bear in mind that every culture has value judgements on emotions, and that this knowledge helps us to create our explications. There was so much more to explore in Lauren’s research, but sadly, time dictated that our session draw to a close. Most participants could still be heard debating the differences between “amazing” and “terrific” as they walked through the door. We were fortunate indeed to have Lauren present such cutting edge research which many of us will apply in our classrooms. Lauren’s PhD project is to create a teacher’s resource using Minimal English. The resource will work its way through the hierarchy of cultural scripts discussed in the workshop all the way down to the cultural keywords that embody the core values of the master scripts. This resource will also include classroom activities based in Minimal English. The explications, scripts and activities will be developed in consultation with teachers in Semester 2, 2016. If you’re interested in getting involved with this project, watch the ATESOL ACT website and Facebook group! Our 2016 Annual General Meeting was held on Thursday 10th March 2016 at the Youth Coalition of the ACT, 46 Clianthus St, O’Connor. 2015 President Jennifer Mayers delivered a report on the past year’s activities, our new Committee was elected, and our new Constitution was passed. The Network provides relevant information on young people and provides a summary of important activities, events resources and information relating to young people and the youth sector in the ACT. Respect and Commitment; 2. Staff Knowledge and Development; 3. Culturally and Linguistically Diverse Workforce and Employment; 4. Culturally Appropriate Service Delivery; 5. Engagement with Communities; 6. Service Development and Evaluation. You may just be looking for information on what the Youth Coalition and the MYAN are all about, but they seem like a good resource or contact point for anyone working with young people between the ages of 12 – 25. The Youth Coalition has recently launched Rate Canberra 2016, the biggest survey of young people in the ACT. This 10 minute survey of 12 – 25 year olds aims to collect information on what it is really like to live in Canberra as a young person, and the issues that are important to young people. Schools and youth services can win $1000 for having young people complete the survey, and prizes are also up for grabs for individual participants. The Youth Coalition coordinate National Youth Week in the ACT. Emma mentioned that they are trying to get a Student Ambassador from each school in the ACT. Please contact them via this webpage for more information. Transitions and Careers: What are the barriers for multicultural young people? For events prior to the current year, please check the Past ATESOL ACT events page.